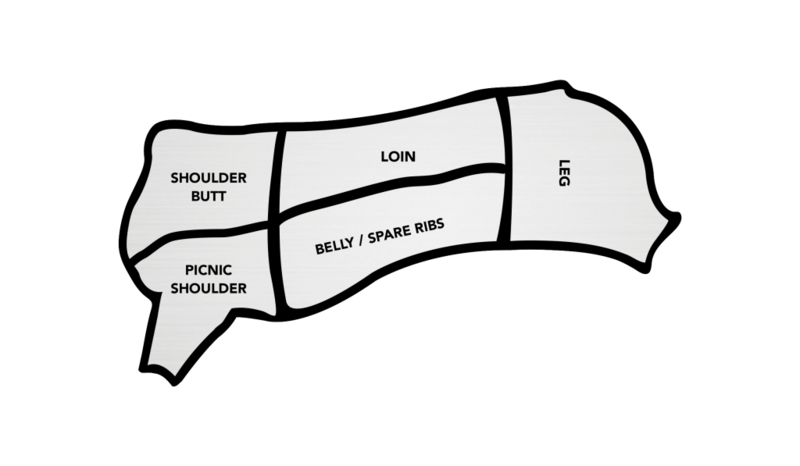 TASTE IS: Berkshire Pork is anything but, “the other white meat”. The meat has a crimson hue and is highly marbled producing a slightly smoky and rich pork flavor that is almost bacon like in its intensity. HOW HEALTHY: Humanely raised by our network of producers and fed a natural diet free of hormones and antibiotics. COOKING TIPS: Berkshire pork requires less seasoning than you may be accustomed to with commodity pork due to the breed’s naturally high PH level. In addition, be careful to not over season nor overcook and be sure to let the meat rest after roasting or grilling. All of this will help to enhance Berkshire’s amazing flavor. Braising is a slow moist-heat cooking method using a small amount of liquid with a tight-fitting lid. Broiling is a quick dry-heat cooking method done in the oven using the broiler setting. Grilling or Barbecuing is a quick dry-heat method over charcoal, wood or gas flames. Roasting is a dry-heat cooking method used for cooking bigger cuts of beef. No liquid is added or cover used. Sautéing uses a small amount of oil or fat in a shallow pan over relatively high heat. Stewing is a slow moist-heat cooking method using a pot with a tight-fitting lid. The pork should be completely covered in liquid.